Germany is under siege -- this time in the form of a a tiny bacteria that has claimed the lives of 22 people, and sickened more than 1,800. Nearly 520 of them have developed a potentially deadly infection which affects the kidneys and nervous system. The disease has spread to twelve countries in Europe and the United States, whose citizens had recently visited Germany. German authorities are puzzled about the origin of the E-coli bacteria. It was initially believed that cucumbers from Spain were to blame, but that has since been withdrawn. The country has asked its citizens to be careful about eating raw lettuce, tomatoes and cucumbers. The latest suspicion is that beansprouts may be the cause, as most restaurants in Hamburg whose patrons fell sick had recently ordered this locally grown vegetable. The economic impact from the ban is affecting farmers in the region who are being forced to destroy millions of vegetables each day as they are unable to sell the produce. 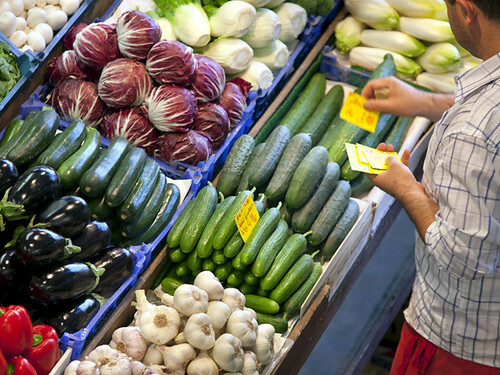 Russia, one of the largest importers of vegetables has angered the European Union by banning all vegetables from Europe. The U.S and U.K are inspecting shipments from Germany and Spain. E-coli or Escherichia Coli is a harmless bacteria that lives in the guts of cattle and sheep. A mild form of the bacteria inhabits the human intestines as well -- it helps break down and digest the food we eat. However, it is the cattle version that can become harmful to humans. Eating undercooked beef, drinking unpasteurized (raw) milk, or drinking contaminated water can cause the bacteria to jump from cattle to humans. During the cattle slaughtering process, the E-coli bacteria can get mixed with the meat and by ingesting it, it reaches a person's stomach and intestines. Here it can cause abdominal cramps, bloody diarrhea, dehydration and weakness. But how does it get into vegetables? Water contaminated with E-coli (runoffs from cattle farms) used to irrigate vegetable farms, or cattle manure used as fertilizers are some of the reasons. While it was first discovered in undercooked hamburgers in the 1980s, the more recent outbreaks have been associated with vegetables such as spinach, lettuce, cucumber and more. We haven't seen this strain before..
Chinese scientists from the Beijing Genomics Institute, the world's largest DNA sequencing center were the first to discover that the latest German outbreak was due to a new highly toxic strain of bacteria. This new E-coli is found to be resistant to most classes of antibiotics used to treat the disease -- such as penicillin, streptomycin and sulfonamide. We had written earlier about how bacteria develop resistance to antibiotics, and become super bugs that are hard to kill (see here). Farmers give low dose antibiotics to their cattle to improve disease resistance and increase milk production -- and researchers have noticed that a single antibiotic can cause the bacteria to develop resistance to multiple classes of the drug. There is concern in the scientific community about this practice of giving drugs to seemingly healthy cattle. Until we find a way to not keep producing these superbug-strains of bacteria. the next best thing is for us to be careful -- wash hands frequently and after using restrooms, wash vegetables and fruits, and eat well cooked foods as heat destroys the bacteria.